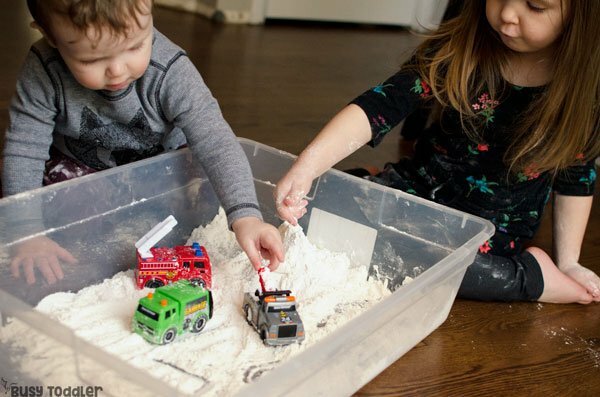 Inside: Flour trucks is a quick and easy toddler sensory bin that’s worth the mess. Ready for an easy activity? It’s just a few cups of flour away. I’m not going to sugar coat things: this got messy. Like really messy. Like I had to mop when my kids were done with this activity messy. But you know what: It was worth it because my kids played with flour trucks for more than an hour. You read that right. This activity lasted more than an hour – 1 hour 17 minutes to be exact – and if you want to see the date stamp on my camera to prove it, I can totally provide that. 5 cups of flour. 3 entertained kids. That quick mop of my floor? Worth it. Normally, my kids do great with sensory bins. Actually, they do better than great. They know “the rules”, the follow our “bin etiquette”, they are sensory bin rock stars. 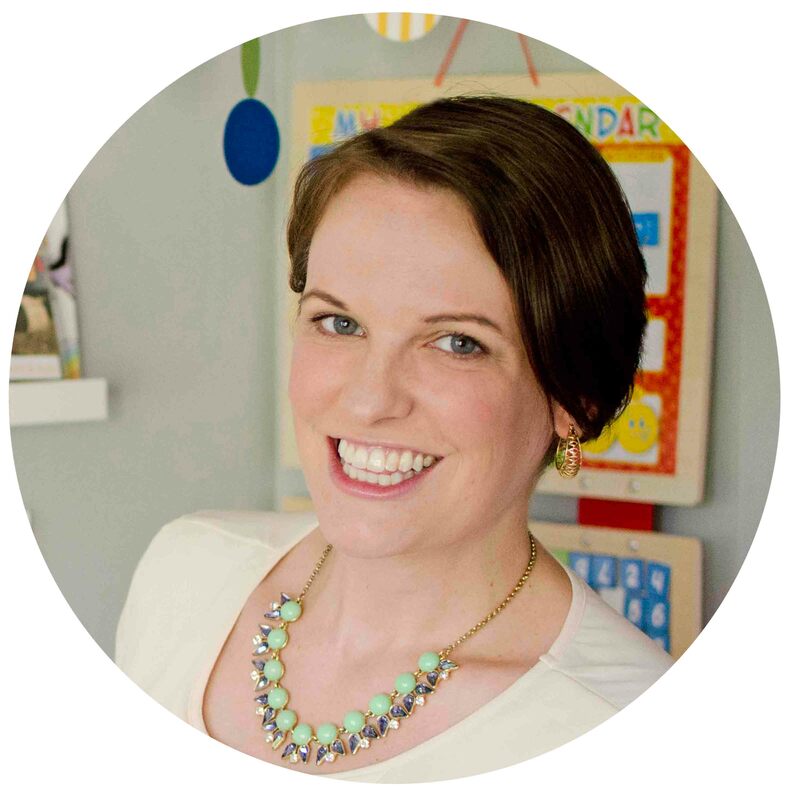 (You can see my tips for teaching toddlers how to do sensory bins here). Buuuuuuuut when flour is involved. All bets are off. Think of how messy you get making cookies. Now think of 3 cups of flour in a storage container and try to play with that. Yeah, it gets messy. But again. It was beyond worth it. Flour cleans up quick. The memories from this activity will last forever. I took out my storage tub and dumped about five cups of flour into it. 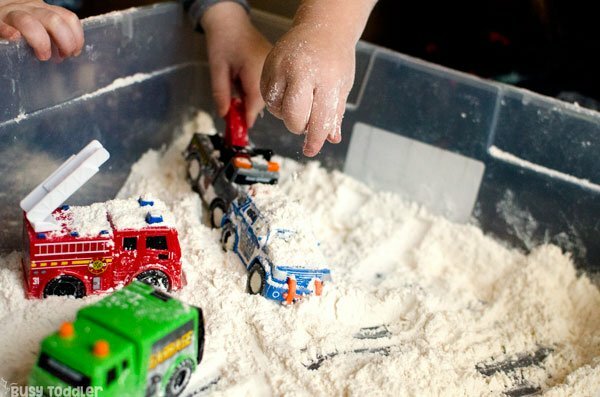 I added in some toy trucks to my kids could drive through the flour and yeah, that’s it. Well, actually not totally it because eventually they added some wooden blocks and Paw Patrol, because obviously those needed to be fake snowed on? It all started with my Taby. 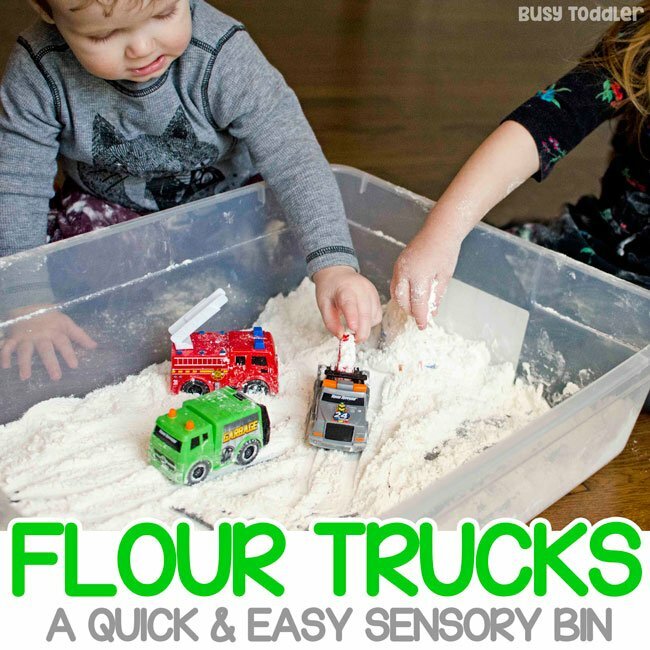 The whole flour trucks activity started with my Taby (toddler + baby = taby = my 16 month old). 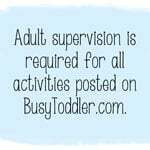 I wanted a winter themed activity that he could play with in honor of our “A Very Toddler Winter Games” series. He needed to get in on the games action. Problem is: games and activities are hard to come by for Tabies. I knew the answer was a sensory bin. 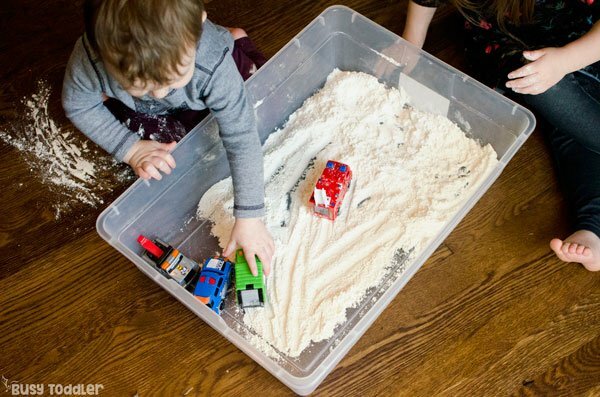 A simple sensory bin. A flour bin. With trucks. “Snowmobiles” if you will. 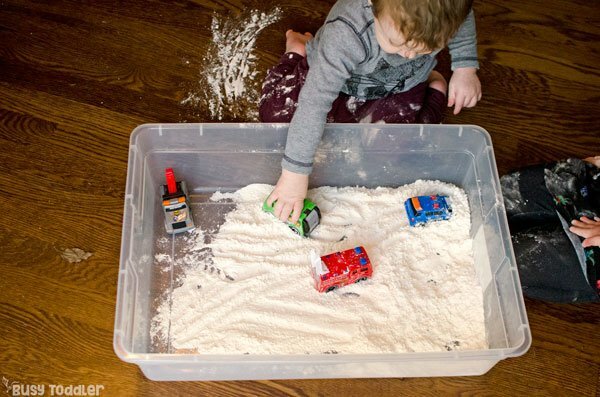 “Snowmobiles” aka a flour trucks sensory bin was the perfect answer for my taby. It’s taste safe, it’s easy to play with, and it’s easy to clean. Let me stop and make something clear. If I wasn’t taking pictures of this activity, I definitely would have put a beach towel or table cloth or ANYTHING down on the flour under this activity. Problem is those don’t photograph pretty. So that’s my hashtag behindthescenes, hashtag momtruth. 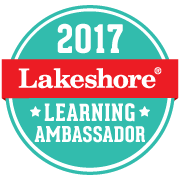 When you do this activity – definitely put something under it. Something about flour is inviting. 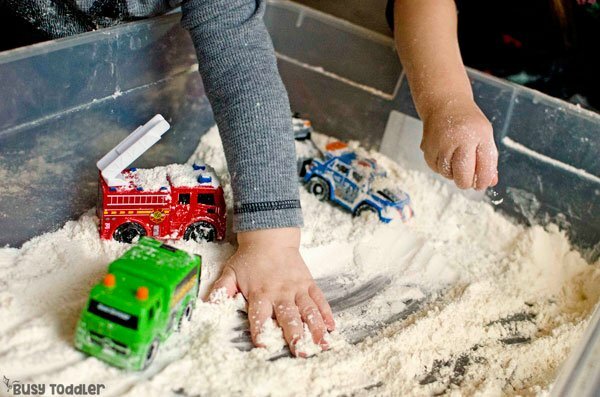 Something about flour makes kids want to play. Something about making a flour mountain for their snowmobile trucks to drive down hooked my kids and hooked them good. So I sat back, watched, and let them do their play thing. And 1 hour, 17 minutes later, after they’d added in a few more toys… well, it was the most amazing morning. 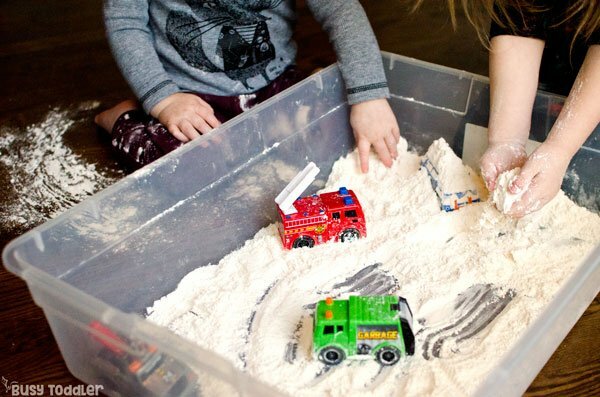 This wasn’t the first time my kids have done a flour sensory bin. It won’t be the last. It doesn’t get old and it cleans up quick and it’s always, always, always worth it. 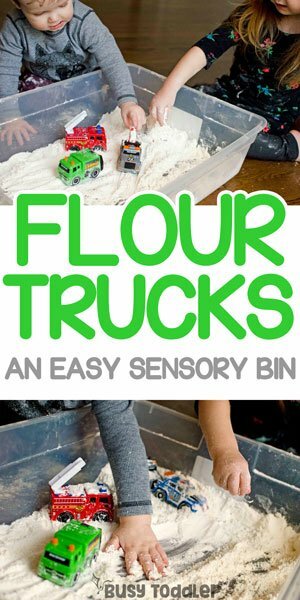 Are you willing to try Flour Trucks?